Please join us for any of our 4 restorative yoga + poetry classes designed to enhance relaxation and wellness for the spirit, mind and body. "Restorative yoga poses are designed to open the body in a gentle and comfortable way. There is no forcing oneself into uncomfortable positions in this style of practice. In fact, many props are used in order to ensure comfort and support." 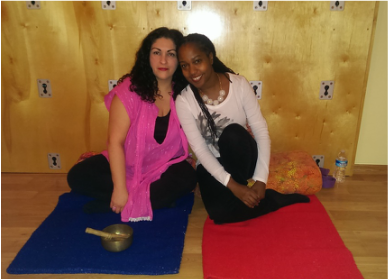 It helps to boost the immune system and teaches participants how to bring calmness to the mind and total relaxation to the body. Julie uses light touch/massage as well to the temple and hands while you are relaxing in poses, and Jacinta reads delicately chosen verse to enhance the relaxation process. There's time too, at the end, for persons to write, if they are inspired. Each session has a different theme but each is designed for your ultimate renewal. No prior yoga or poetry experience in required to benefit from yoga-try. Bring your yoga mat, if you have one. Everything else will be provided. ﻿Advance payments only﻿ online (click the amount below to be taken to the payment page) or check via mail: The Word Project, 909 Wimberly Way Court, Kernersville, NC 27284. Saturday, February 7, 2015, 6:00-7:30 p.m.
Saturday, February 14, 2015, 10:00-11:30 a.m.
Saturday, April 11, 2015, 10:00-11:30 a.m.
Saturday, May 2, 2015, 10:00 - 11:30 a.m.
Julie Dunton is a 200 hour certified yoga teacher, who has studied under Valerie Kaiser owner and founder of Sunrise Yoga Studio in Clemmons, NC. Seven-years ago she took her first yoga class, and knew it was something she wanted to do the rest of her life, and continues her studies with the 300 hour certification teacher training program. Julie has also studied with Mark McCullough, Becky Hieter, Elaine Round, and has taken workshops with Cindy Dollar, and Jason Scholder. Julie enjoys teaching restorative yoga, water yoga, beginner yoga and partner yoga, and has a unique gift as an instructor. Jacinta V. White is a published poet who has been facilitating poetry writing workshops for healing since 2001, when she founded The Word Project. To read more about Jacinta and her work visit www.jacintawhite.com. Julie & Jacinta after a yoga-try class.